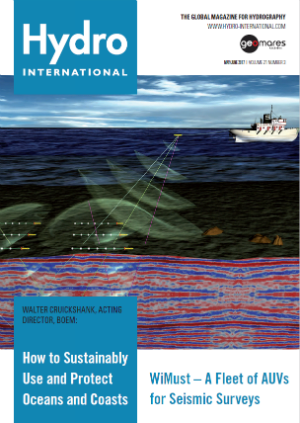 The focus of the Hydro International May-June 2017 issue is Seismic Survey. You'll find articles on this subject in addition to the regular columns. Do you like it better to have the magazine in your hands? Get the print edition! Page 16-18: The ongoing WiMUST (Widely scalable Mobile Underwater Sonar Technology) project aims to design and test a system of cooperating autonomous underwater vehicles (AUVs) that would simplify seismic surveying and offer significant advantages over modern streamer-towing operations. Read now. Page 11: The first Assembly of the International Hydrographic Organization was held in the Auditorium Rainer III of Monaco, from 23 to 28 April 2017. I have entitled my report after a quotation by Jean Monnet, French politician and one of the European Community’s founders: Les hommes passent, les institutions demeurent. The director Gilles Bessero mentioned it in his farewell speech at the end of the Assembly. The report by Giuseppe Angrisano offers an impression of the event and the decisions made. Read now. Page 12-15: During the recent Offshore Technology Conference in Houston, Texas, USA, the Executive Order on Implementing an America-First Offshore Energy Strategy was signed to support offshore science development. In the context of the highly dynamic offshore energy sector, Hydro International interviewed Dr Walter Cruickshank, acting director of the Bureau of Ocean Energy Management (BOEM), about accelerating authorisations for seismic surveying, marine geospatial data, environmental monitoring and the potential of marine renewable energy. Read now. Page 19-21: Shore-based marine radar techniques have recently proved to be an excellent tool for monitoring erosion and accretion in the dynamic nearshore area through repeated and automated large-area surveys. The ability to routinely survey intertidal areas has always been logistically challenging and expensive due to the limitations imposed by the tides, weather and access. Advances in remote sensing techniques and the development of new data-processing algorithms have made the surveying of these areas much more cost-effective. Read now.